We provide four levels of clean! 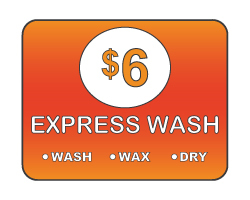 From the quick and affordable Express Wash to the all-inclusive Supreme Wash, we're sure to have a wash that suits your needs. We also have vending machines on-site to provide any extra amenities for your vehicle. And always remember when you purchase a car wash, you're welcome to use our free vacuums! We strive to make having a shiny clean car simple, convenient AND affordable! 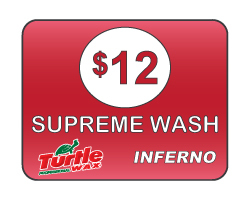 In an effort to reward our loyal returning customers, when you purchase 10 of the same wash, we will give you 2 additional washes for FREE!